Powerful tabletop synthesizer with expansive sound design abilities. 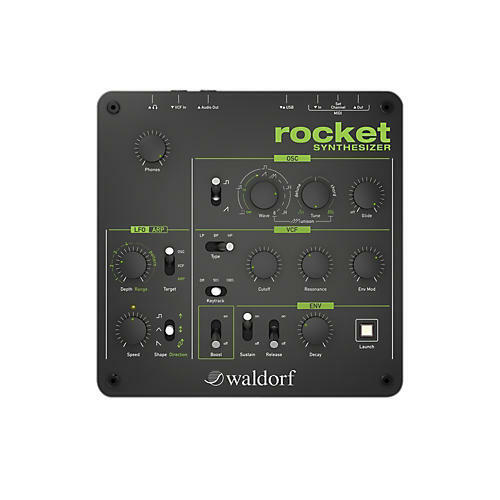 The Rocket is a powerful tabletop synthesizer from Waldorf that that will propel your creativity into reaching sounds from another world. The Rocket is your vessel to inspiring sound design with a fun and easy to manage control surface that will guide you through its heavy filters, wobbling LFOs, and expansive arpeggios. Standard MIDI I/O and USB port will transfer all your commands, and there's a VCF input so you can use the Rocket as a filter box for other sources. The sound of the Rocket is much louder than the legendary Saturn V engine, and features an analog multimode VCF with lowpass, bandpass, and highpass, resonance up to self oscillation and beyond, a powerful monophonic oscillator section with Ultra High Density Sawtooth and unison for chord play. Equipped with a powerful Arpeggiator and a destructive Booster circuit, this Rocket is technologically way ahead of all current defense systems. It works as a stand-alone instrument or in any imaginable music production environment. But its most important feature is of course its sound: a real Waldorf synthesizer, powerful, direct and with a lot of love for the details. Launch your creativity to another world with the Waldorf Rocket.